When the wide world of artists found out that Jack Unruh, the modern master of pen illustration, was facing an aggressive disease, it became the catalyst for a phenomenal outpouring of love and creativity. There must be countless individuals like me, who have never met him or worked with him, and yet we are pulling for him every day, because the singularity of his vision, the authenticity of his approach, and the affection for subject that he communicates — all have left a deep impression for many years. In sync with many creative professionals, I have joined the surge of “hearts beating a path to his door” in Texas. 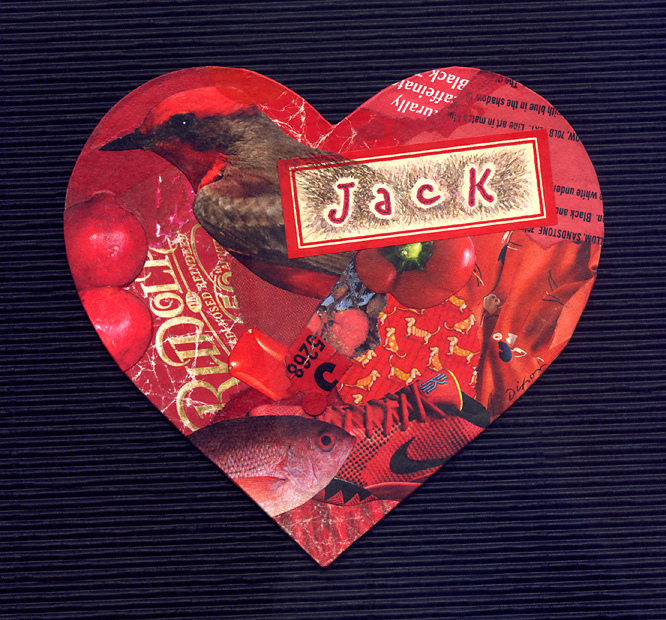 If you want to send Jack a heart, too, his address easily can be found at his fabulous website. 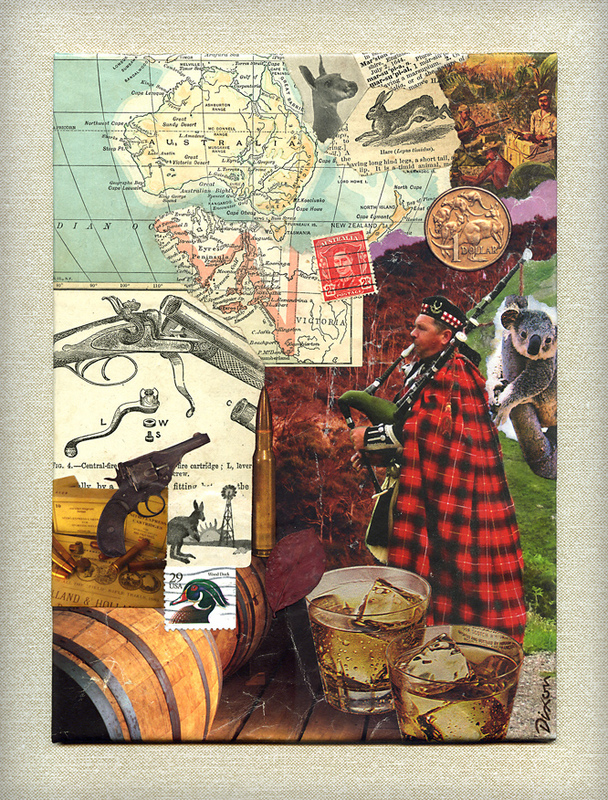 For the second consecutive year, I had the opportunity to create a collage as prize art for the preeminent single-shot rifle match held in Kentucky. 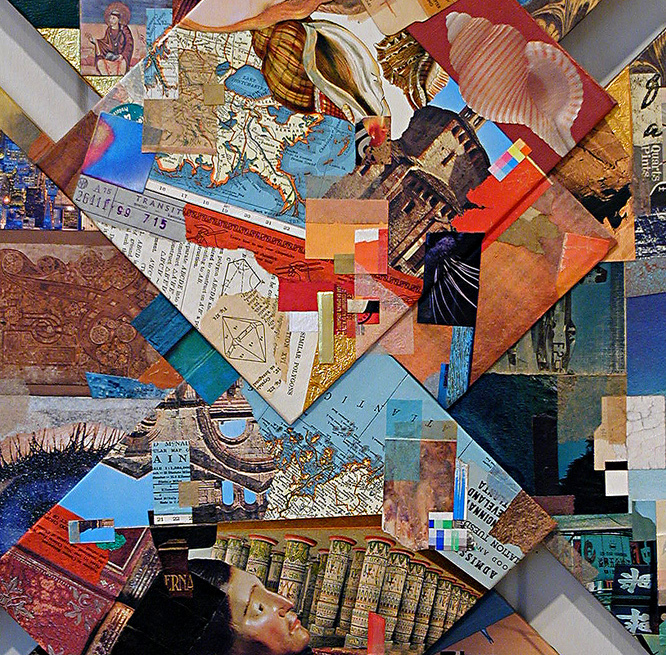 Visitors to this blogsite know my ongoing fascination with collage as an ideal medium for total spontaneity. Of course, it also lends itself perfectly to a planned, thematic solution for specific appeal. I discovered enough ingredients in my stash of papers to cover the Australian topic, but also to entertain a desired level of synchronicity to encompass a few distinctive characteristics of the event. 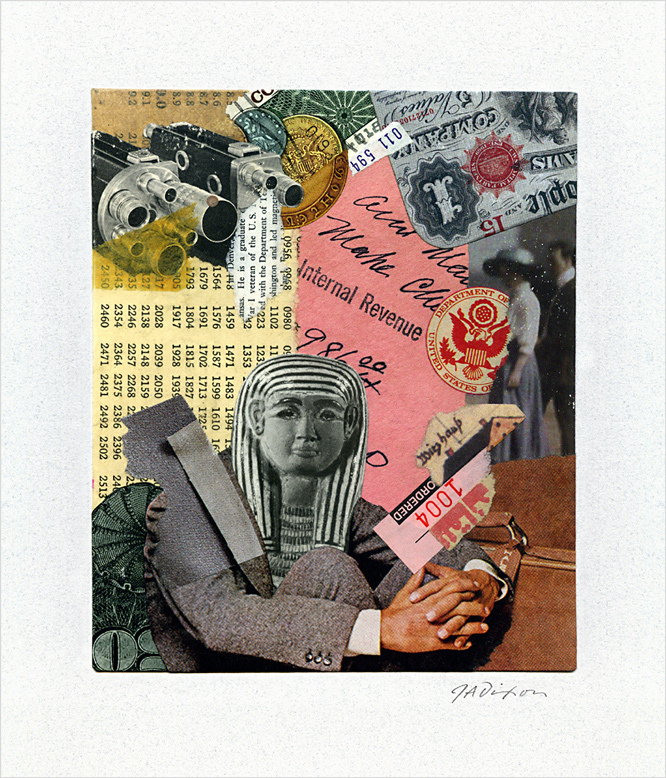 In addition to my personal enjoyment, I am always pleased to see the positive response to collage as art. It has to be more than the element of the unexpected, although, admittedly, collage is never what people anticipate in these situations. I think it may be the particular combination of accessibility, interactivity, and “mystery” so inherent in the medium. I suppose there is more to said about that, but we shall save it for another day. 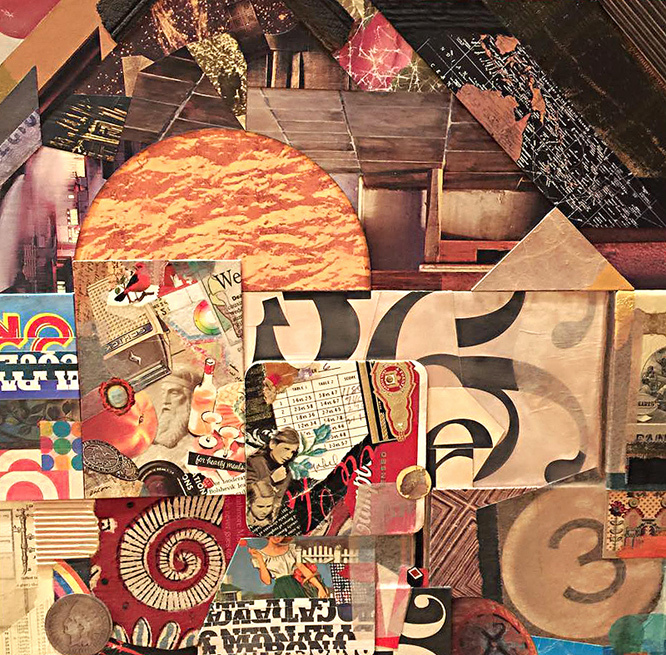 a collage adventure . . . 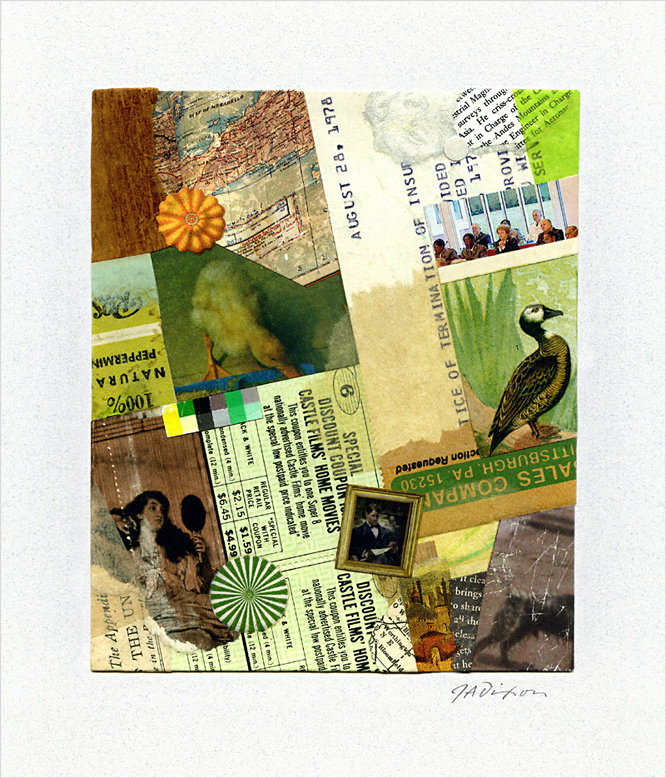 Remember the “start” I sent to Kevin Brandtner for the Adventure Collage Collaboration? Here is his wicked finish. 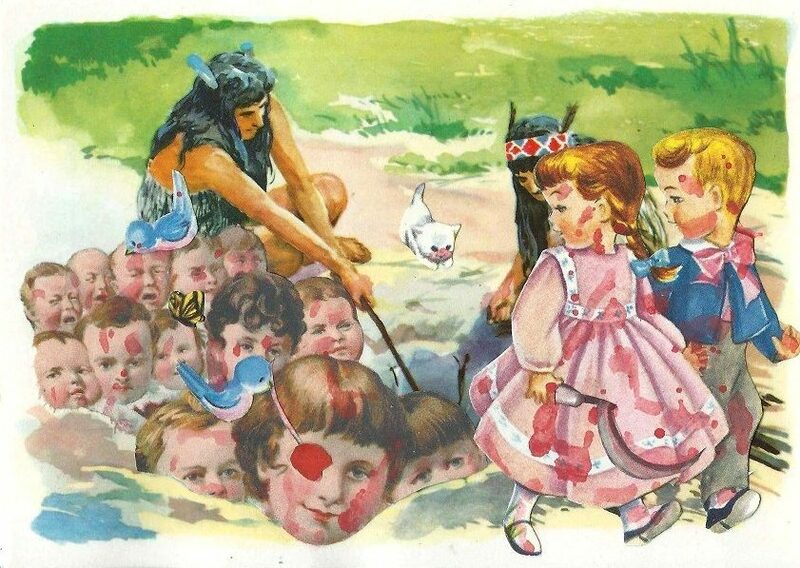 I didn’t think the collage could get even more macabre. God help us, Geronimo. 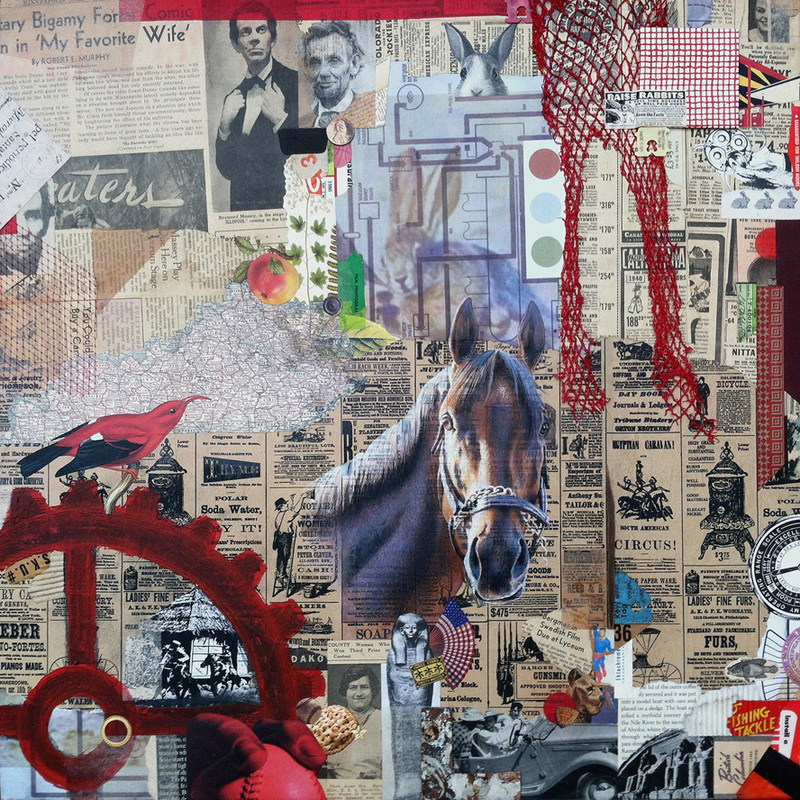 One of the most satisfying occurrences of the year so far was to learn that Kentucky Sovereign, my collage collaboration with Robert Hugh Hunt, had been accepted into the 2016 Governor’s Derby Exhibit. 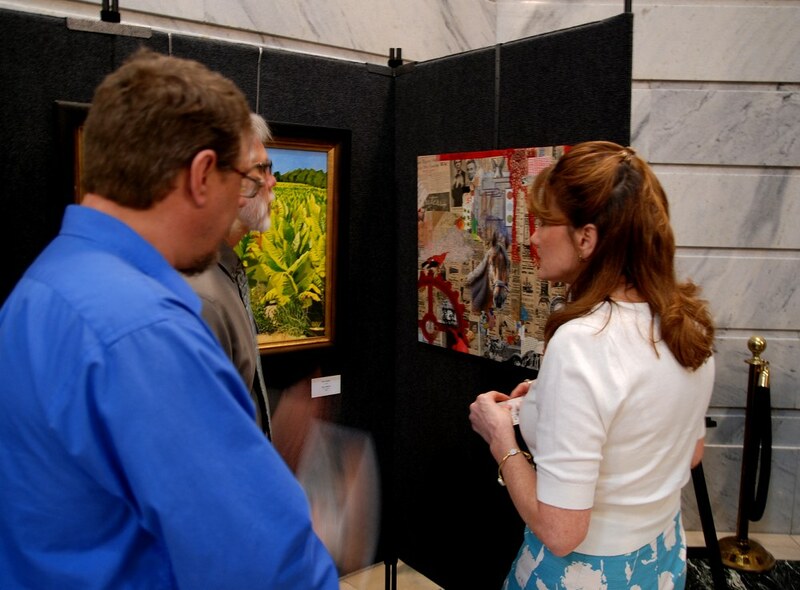 The two of us never dreamed that the piece would find its way to the Capitol Rotunda in Frankfort, but there we were, getting to meet the First Lady and explaining our unusual work of art. 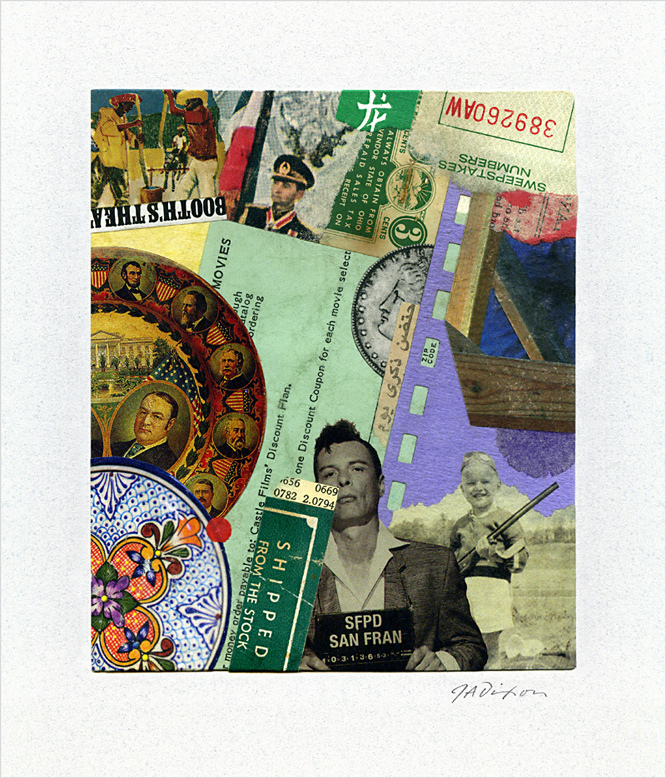 Hunt’s Mama’s Story also made the cut, the only “traditional” collage in the show (a black and white gem). 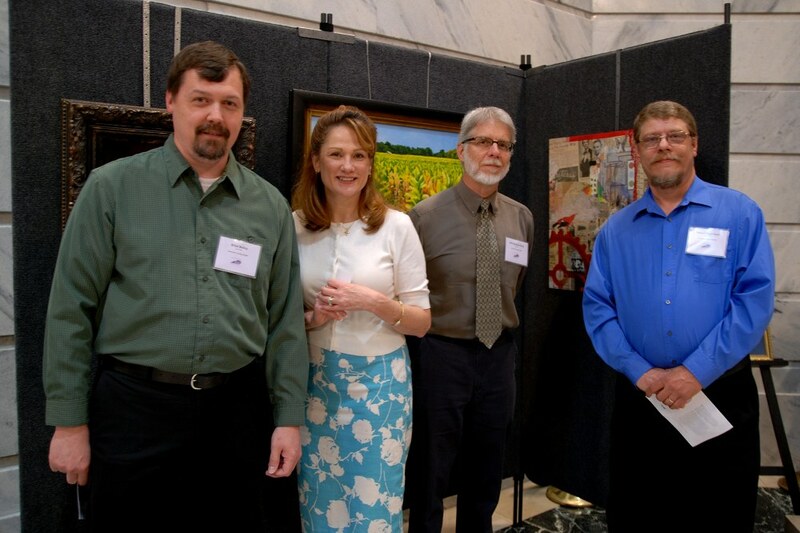 Needless to say, to have any aspect of my creative life represented in this high-profile exhibition is a distinct pleasure, especially because it’s a part of the Kentucky Arts Council’s 50th Anniversary celebration. The exhibit lasts until May 7. Robbo and I are already conspiring to initiate a second collaborative project. Visit here again to learn more about it! 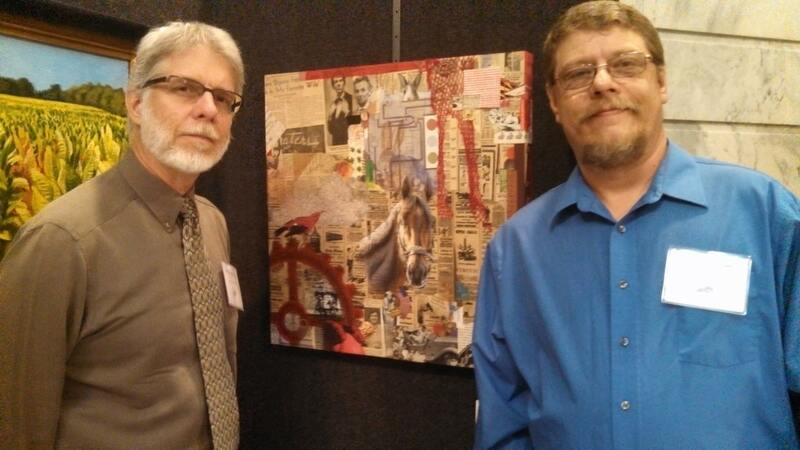 Robert Hugh Hunt and I explain our collage collaboration to Glenna Bevin. From left— painter Brian Bailey, Kentucky’s First Lady, J A Dixon, and R H Hunt. 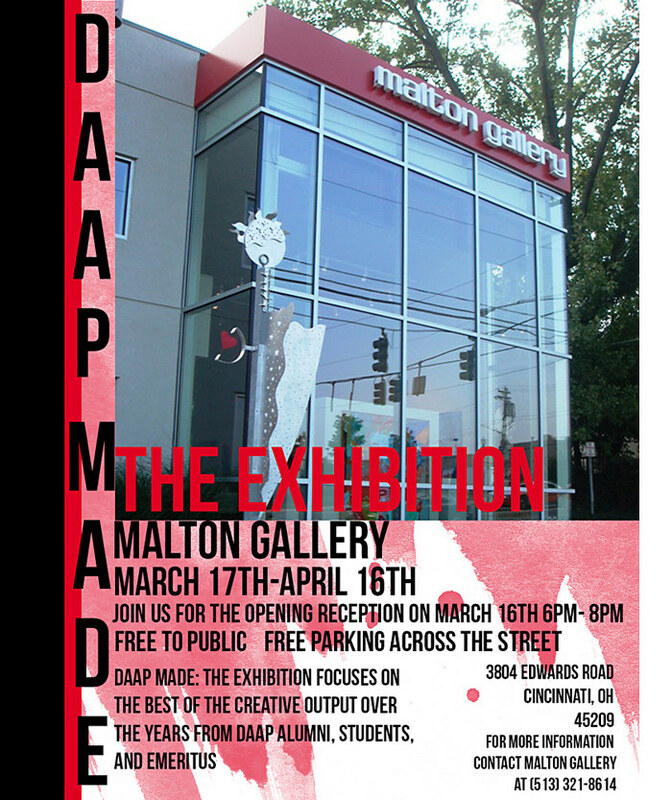 Yesterday I finished participating in the Malton Gallery’s DAAP MADE: The Exhibition, a contemporary showcase for those with a connection to the University of Cincinnati’s Collage of Design, Architecture, Art, and Planning. 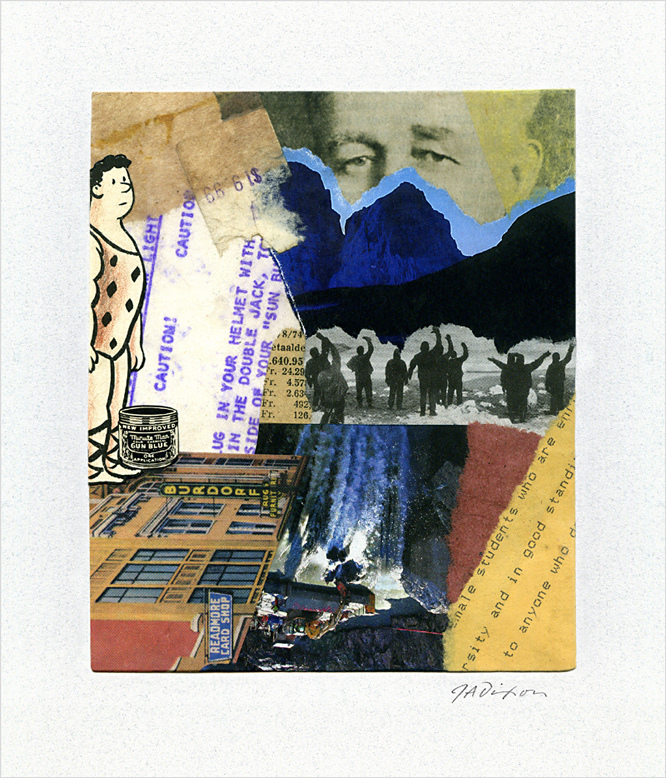 I was mildly astonished to have two large collage artworks accepted for display. It’s been awhile since I had something featured in Cincinnati, having left the school over 40 years ago with a degree and mixed emotions. 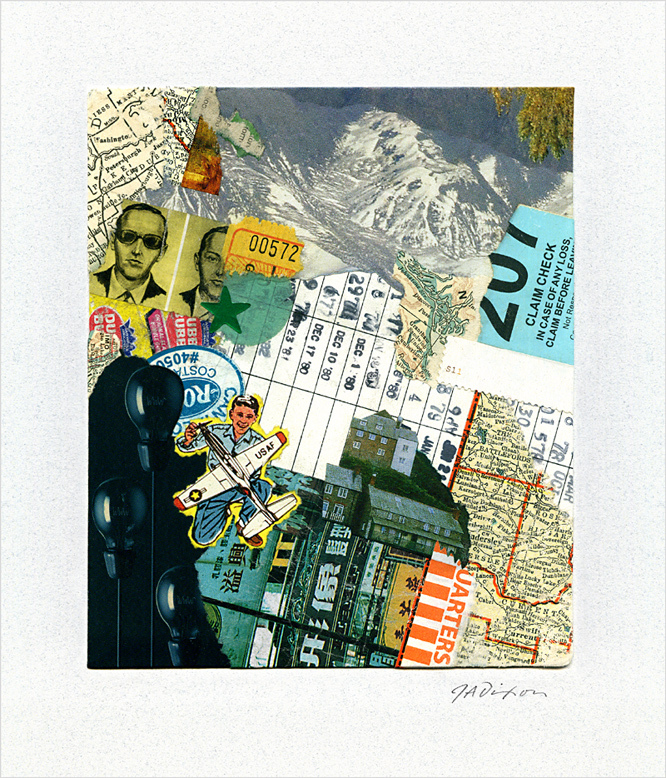 My destination was Chicago, to accept a graphic design position, and I was not inclined to look back. It had been a rigorous program that left scars on my creative self, but it fully prepared me for the demands of becoming an independent professional. Trust me, everything worked out just fine. 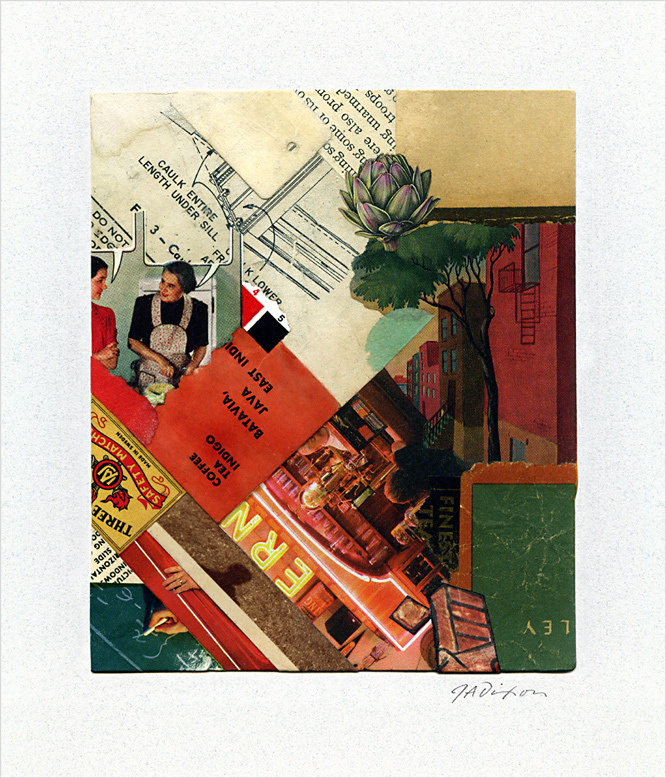 You are currently browsing the The Collage Miniaturist weblog archives for April, 2016.